Are you a Lewis Carroll fan? Are your kids? My reactions are mixed. I have always cared for his poetry, and I especially love the way Jabberwocky encourages us to play with words and sounds. 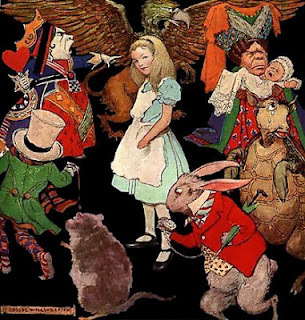 However the charm of the Alice in Wonderland story has always eluded me. Still, Mad Hatter Day just begs to be celebrated. 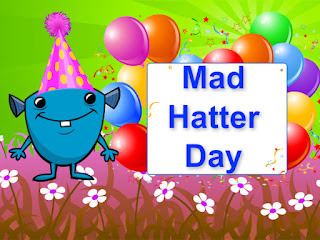 The day apparently began when some computer programmers noticed that the original Mad Hatter image sported a sign in his hat, "In the style 10/6". October 6 subsequently became a day for celebrating silliness. Something The Book Chook could never pass by! Click on the Celebrate button in The Book Chook blog's right sidebar for more special celebrations and ideas.